Highlighting our manufacturing capabilities is our precision screw machining service. Consisting of both cam driven and CNC controlled machines, our single and multiple spindle screw machines can provide our customers with high quality products in any production quantity. 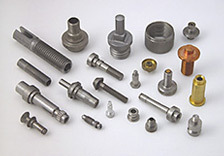 Producing screw machine parts has been the mainstay of our business since our beginning over a 100 years ago. With experience, innovation and technology we continue to produce close tolerance, quality parts to service a competitive market. At Ohio Metal Products we’ve known for over a century that any screw machine shop can produce a precision part, but it takes dedication to deliver on time, every time. Our customer service team will work closely with you to establish an ordering arrangement that is most beneficial to you. We accept blanket orders, as well as supporting Kanban and just-in-time delivery systems. To learn more about our precision screw machining services, see the following table or contact us directly. Diameter + / - .0005 in. Length + / - .001 in. Diameter + / - .001 in. Length + / - .003 in.